The forest is turning into a lake, slowly but surely. Its resident ducks love this, but they are becoming confused. The preponderance of ponds has gone to their little ducky brains. Air or water? Flying or swimming? Which to choose, which to choose? Yesterday, yards ahead of us, a duck was taking a walk. It chose not to use those glorious wings but to potter from puddle to puddle with all the avaricious greed of a prospector who has found gold. Mine, its little ducky thought processes were going, All Mine. From where we were standing its spindly legs were going like the clappers, elevating that unlikely body just inches above the mire. It is the shape of the duck which causes such affection and merriment among us humans. Surely, it should topple over? Once again Nature bests us with an ingenious large webbed foot which can hold even the most ungainly weight distribution suspended in the air. But the feet were dispensed with all together when toy makers chose the duck a favourite bath toy: the rubber duck. 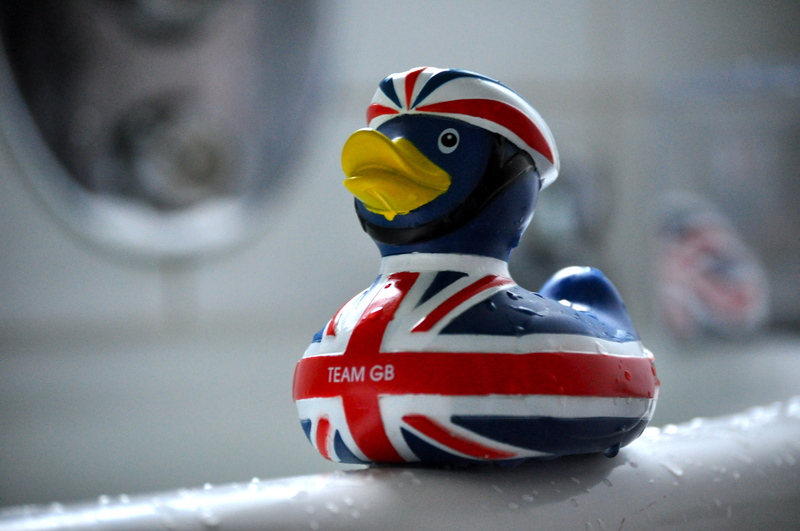 Felix has just acquired a splendid rubber duck: an Olympic version with a cycle hat on, and TEAM GB emblazoned on its bottom. It carries an air of unmistakable authority like some official of the Empire, but it all goes tails-up when it gets in the bath. The small duck begins to ship water the moment it get into the tub, and lists ingloriously to one side or the other. Oh, how the mighty have fallen. Patents for moulding rubber appeared in the 1840s. But the examples of rubber ducks seem to date from the ’50s. Some are better at floating than others. Some are not even designed to float, but just to keep out the water for play purposes. But it is that ability to be flotsam that charms my son. The floating is the thing. It is just this quality which has immortalised the rubber duck – and other floating toys – in the annals of oceanography for all time. And all because of the gyre. I know: you believed gyre to be a fictional Lewis-Carroll-type invention. But the gyre is a real thing and it lurks out there in the centre of the world’s vastest stretches of water, like some monstrous Greek myth. This is the story of how the little rubber duck met the great, ogrous, subarctic gyre. In 1992, a cargo container of children’s bath toys fell overboard in the middle of the North Pacific Ocean: at 44oN, 178oE. There were rather a lot: 29,000 to be precise. Turtles, ducks, beavers and frogs. The story transfers to a pair of Alaskan beachcombers. Dean and Tyler Orbison, who lived in Sitka, Alaska, made repeated finds of rubber toys on the beach, totalling about 3.3 per cent of the original spill. And like any self-respecting bloke would, they recorded their finds meticulously. They counted them. They made charts and spreadsheets of them. Of the toys recovered, 26% were beavers, 21% were frogs, 18% turtles: but a massive 35% were found to be rubber ducks. Champion floaters. They had made it courtesy of the subarctic gyre: a huge ocean-wide circular current which is a result of a quarrel between the earth’s rotation and its stolid inertia. And the little ducks (and beavers and frogs and turtles) helped scientists to work out that it takes three years, roughly, to orbit the subarctic gyre. Global navigators, these rubber ducks. Essential to science, you know. No wonder Felix’s duck looks so self-important. Posted in WhimsyTagged ducks, oceanography, rubber ducks, subarctic gyreBookmark the permalink. What a winning combo, Sidey! Every woman should have one! He is gorgeous, but like many good looking things fatally flawed, Debra 😀 He would not be able to float to the other end of our bath, let alone Alaska. Again with the entertaining thing 😉 I bet those scientists have failed to acknowledge that the ducks and other assorted plasticy floaty things may have stopped amidst the gyre for an extended play time with for example the whales. Gabrielle, you may have hit on something. The journey takes six months but they use two and a half years to play. You are a genius, Gabrielle. Listing Ducks is a frightening image. Now I’ve got lisitng Tolpuddle Martyrs with big noses in there too Kate. What ARE you doing to me? Quack Quack Glug……. Erk…..sounds like you have a nasty case of Listing Duck Trauma Syndrome, or LDTS, Jim. I’d give NHS Direct a call. Love the little Olympic Duck. Now I know why I never seem to get anywhere, I’m caught in my own miniscule gyre. HELP, Spin me the other way!! Ah, a suitably metaphorical gyre, Lou! You’ll start us all off! Now, if you could just export some of that rainwater to those of us whose lakes and ponds and grasses and cornfields and trees are shriveling and withering away . . . (this from one who generally prefers sunshine and warm over all). It is a shame we can’t do a huge redistribution exercise, Karen…. I shall need an on-the-spot report next year , Karen! Just a thought: when did rubber ducks stop being made of rubber and become plastic? And is this a problem, as being plastic they are very light and therefore carry no ballast to help them remain upright? A simple solution should be available, one would have thought, in this day and age, to be able to design a duck that will float in a dignified manner. The available online history of rubber ducks is a void, Pseu: I can find very little about them at all. We need someone from Antiques Roadshow. OK Me-ducks. Who shall we invite?! Fun post, Kate – and isn’t the subject of it all very cute, now, even if he can’t float. For some years, a favorite fundraiser was duck races. Some enterprising chaps came up with the idea of renting x amount of ducks to an organization. The organization would sell the duck chances, which were numbered to correspond to a duck. One could buy, say, three rubber ducks, keep the stub, and on the big day, come to the duck races down the local river or creek. Hundreds of unsuspecting rubber duckies would be tossed into the water and they would all swim, as only rubber duckies can, to the finish line with hordes of usually rational folks cheering the little guys on. I have a yen to visit one of these, Penny 😀 What a sense of occasion the onlookers must have! We have rubber ducks in USA too. There are 535 +1 of them in Washington DC. Are there any good ducks, and true? I have a classic rubber duck and rubber duck stoppers on the bottom of my shower…But that is a different story that involves a broken nose. Aha. I do not like to chortle at the duck-induced misfortune of others, but I wuld give a fair amount to hear that story, Belle…. I just added it to my list 🙂 I have a very lovely crooked nose! Felix’s duck is adorable. It’s a sad day when a rubber duckie won’t float as it’s supposed to. Souvenir or not, ducks of all kinds are supposed to float upright.